Modi wows Madison Square Garden Jump to media player Thousands of Indian-Americans heard Indian PM Narendra Modi speak on Sunday at Madison Square Garden in New York; he meets President Obama on Monday. Modi speaks at Madison Square Garden Jump to media player Thousands of Indian-Americans have gathered at Madison Square Garden in New York for a speech by Indian Prime Minister Narendra Modi. Indian PM Modi heads to the US Jump to media player India's Prime Minister Narendra Modi lands in the US on Friday. The BBC's Yogita Limaye looks at what the countries hope to get out of the talks. Who is Narendra Modi? Jump to media player Ritula Shah travels to India to find out more about Narendra Modi, the son of a tea seller who has become a formidable politician. Modi's first 100 days in power Jump to media player Indian Prime Minister Narendra Modi has completed his first 100 days as leader of the country. John Kerry eyes trade boost with India Jump to media player John Kerry is leading the first US delegation to India since Prime Minister Narendra Modi won a landslide victory in the elections in May. President Obama is to welcome India's Prime Minister Narendra Modi to the White House on Monday. 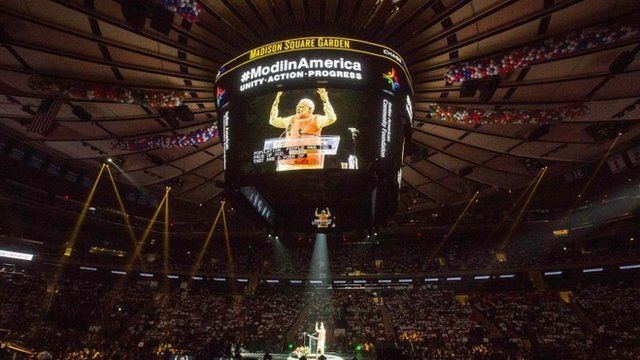 Mr Modi was given a warm welcome by thousands of Indian-Americans at Madison Square Garden in New York on Sunday. He told the excited crowd that the 21st Century could well belong to India.